Why we love it: This shampoo and conditioner set works to nourish the hair while balancing the scalp’s natural oil production. 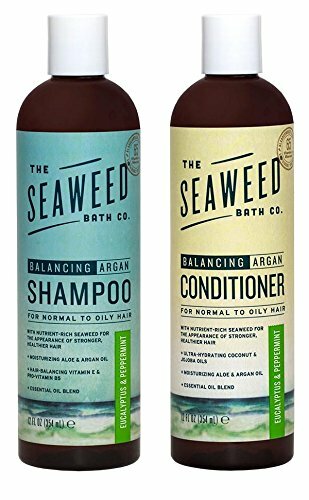 Organic Bladderwrack Seaweed in both the shampoo and conditioner delivers an abundance of natural hydration and vitamins to the scalp and hair. Aloe and Argan Oil moisturize and soothe while Eucalyptus and Peppermint refresh the scalp and calm excess sebum production. Ideal for oily hair. Lather shampoo into wet hair. Rinse. Follow up by smoothing and combing conditioner through the hair. Rinse. Shampoo: Aqua (Water) with Fucus Vesiculosus (Bladderwrack Seaweed) Extract, Aloe Barbadensis (Aloe) Leaf Juice, Sodium C14-16 Olefin Sulfonate, Cocamidopropyl Betaine, Decyl Glucoside, Sodium Cocoyl Glutamate, Argania Spinosa (Argan) Oil, Panthenol (Pro-Vitamin B5), Vegetable Glycerin, Hydroxyethylcellulose (plant derived), Ricinus Communis (Castor) Seed Oil, Babasuamidopropyl Betaine, Citric Acid, Sodium Laurylglucoside Hydroxypropylsulfonate (vegetable derived), Polyglyceryl-10 Laurate, Eucalyptus Globulus (Eucalyptus) Essential Oil, Sodium Benzoate (natural version), Potassium Sorbate, Gluconic Acid (plant derived), Tocopherol (Natural Vitamin E), Mentha piperita (Peppermint) Essential Oil. Conditioner: Aqua (Water) with Fucus Vesiculosus (Bladderwrack Seaweed) Extract, Aloe Barbadensis (Aloe) Leaf Juice, Cetearyl Alcohol, Glyceryl Stearate, Stearylkonium Chloride, Argania Spinosa (Argan) Oil, Panthenol (Pro-Vitamin B5), Simmondsia Chinensis (Jojoba) Seed Oil, Cocos Nucifera (Coconut) Oil, Persea Gratissima (Avocado) Oil, Hydrolyzed Barley Protein (gluten-free), Hydrolyzed Soy Protein, Olea Europaea (Olive) Oil, Vegetable Glycerin, Citric Acid, Gluconic Acid (plant derived), Tocopherol (Natural Vitamin E), Sodium Benzoate (natural version), Eucalyptus Globulus (Eucalyptus) Essential Oil, Potassium Sorbate, Amodimethicone, Mentha Piperita (Peppermint) Essential Oil.